The first call ever made on a cellular telephone was made in New York city, and Federal Express (FedEx) commenced operations. The Pioneer 11 space mission was launched to study the solar system, Liverpool won the English league football championship and Pablo Picasso died aged 91. In music, the Eurovision Song contest was won for the second consecutive year by Luxembourg, ‘Tie a Yellow Ribbon Round the Ole Oak Tree’ by Dawn (feat. Tony Orlando) topped both the UK and US charts, and David Bowie released his sixth studio album ‘Aladdin Sane’. Meanwhile, in Brescia near Milan in northern Italy, a young musician and engineer named Guido Noselli was frustrated by the inability of contemporary sound systems to accurately deliver his performances to audiences. His ambition for sonic improvement coincided with the emergence of the European disco scene of the mid-70s and the subsequent demand for powerful, full-range loudspeaker systems. Outline was taking its first steps towards becoming one of the most innovative pro-audio manufacturers in the world, guided at every turn by our founder’s mantra: ‘Delivering the true audience experience’. Fast-forward to 2013 and all of Outline’s design and engineering is still subject to the principles laid down by Guido Noselli four decades ago. Much has changed since 1973 and the world is in many ways a very different place, not least in the expectations of live event audiences. Today they rightly expect pristine audio quality in every seat, regardless of venue or type of performance, while professional engineers and technicians expect systems to have the power, flexibility, controllability and reliability necessary to meet those expectations. Outline technology delivers all this and more. Outline’s unabated determination to produce the finest professional loudspeakers systems available today continues at Frankfurt Musikmesse 2013 with the launch of the all-new GTO C-12. With its technology derived completely from the large format dual 15" GTO (first introduced in 2011) the new GTO C-12 produces output power surpassed only by its ‘big brother’ - but from an enclosure that is physically smaller and 30% lighter! Incorporating our V-Power Concept and patented DPRWG Wave Guide, and using the most advanced transducer technology available, the GTO C-12 carries the familiar high-resolution signature sound synonomous with the Outline brand and family of world renowned line array products. This remarkable new loudspeaker will form the centerpiece of Outline’s stand at Frankfurt. Also at the Outline booth, the DVS powered range has been re-engineered to include iMode remote monitoring and control, with the DVS 12P and DVS 15P now fully bi-amped via twin internal amplifiers. 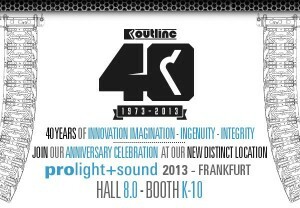 Outline will be on booth K10, Hall 8 at the 2013 Frankfurt Musikmesse.